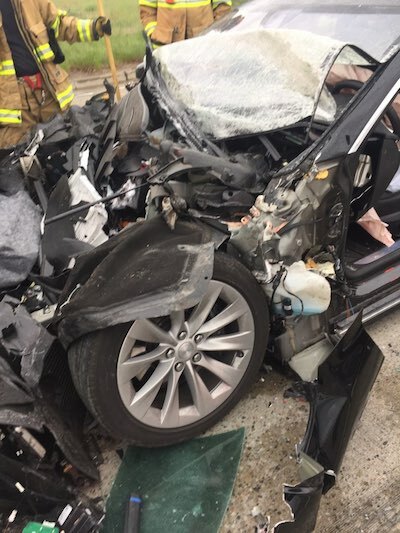 The latest high-profile Tesla crash gives us a strong sense of déjà vu. 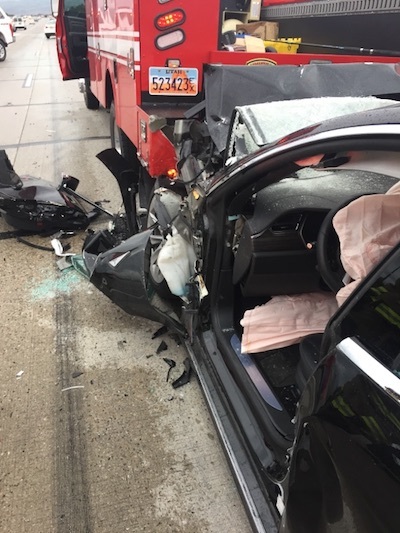 On Friday a 28-year-old Utah woman was hospitalized after her Tesla Model S collided with the back of a Unified Fire Authority fire truck at a speed of 60 mph. The Tesla driver admitted to activating Autopilot before diverting her attention to her phone. 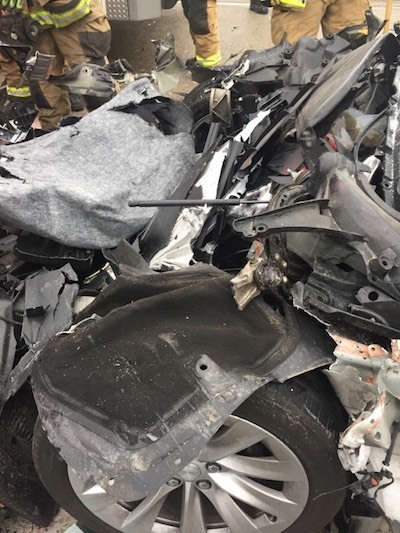 The accident was initially detailed in a Saturday press release by the South Jordan Police Department, which stated that the affected fire truck was stopped at a red light around 6:30 p.m. when the incident occurred. 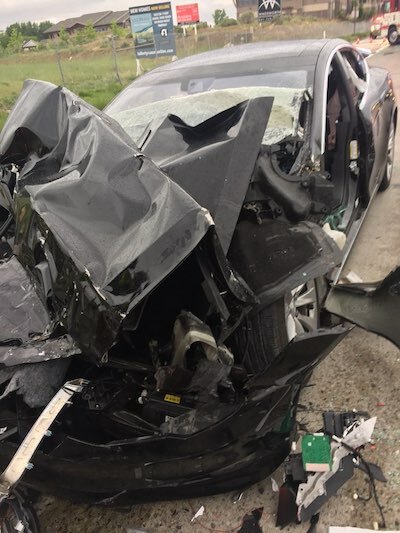 While the Tesla's occupant suffered a broken ankle and a wrecked car, the truck and its driver were relatively unhurt, and departed under their own steam after an investigation by the SJPD. Witnesses report seeing no indication of braking or evasive action by the driver of the Tesla. 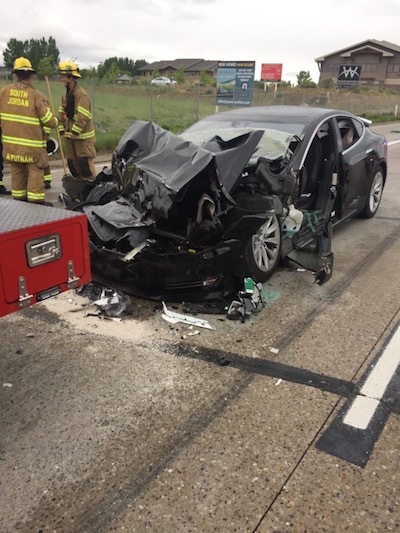 "For unknown reasons, the Tesla failed to stop for the traffic at the red light, and ran into the back of the Unified Fire Authority vehicle at 60 miles per hour," stated Sergeant Samuel Winkler in the initial press release. A followup release issued to The Drive revealed the results of the SJPD's investigation of the crash. When interviewed by the department, the driver said she activated Autopilot before being distracted by her mobile phone. Tesla technicians were confirmed to be in contact with department officials, who would cooperate to extract telemetry from the seconds leading up to crash from the car's computer. Some may have a sense they've seen this before. 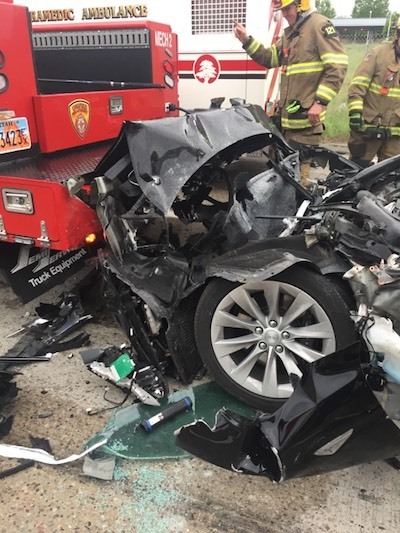 The crash has much in common with another accident dating from January, in which another Model S rear-ended a stationary fire truck at highway speed. As a result of that crash, however, the fire truck was damaged heavily enough to warrant temporary removal from service. The driver of the January accident claimed Autopilot to be responsible for the crash, prompting a National Transportation Safety Board investigation, the conclusion of which is not yet known. Tesla demands that its drivers keep their hands on the steering wheel and pay attention on the road, even with Autopilot active, which the SJPD too reiterated in its second press release on the accident. Despite the common misconception that Autopilot allows autonomous driving, it is no more than a set of automated driving assists, on which drivers are not supposed to rely. Regardless of whether Autopilot was active at the time of impact, the driver will likely be held at fault, due to the admission that her focus was directed to her phone. Autopilot or not, drivers are responsible for the movements of their vehicles. Every time a driver points the finger at Autopilot for their accident, Tesla owners scale back their use of the feature. The wait will soon be over for customers looking for a more feature-rich Model 3. The new locations will be responsible for building Tesla's next vehicle, as well as ramp up battery production. The more Mr. Musk upsells his products, the more we hope he doesn't have to eat his words. Anheuser-Busch has placed an order for up to 800 hydrogen-electric powered semi-trucks from Tesla rival Nikola Motors.